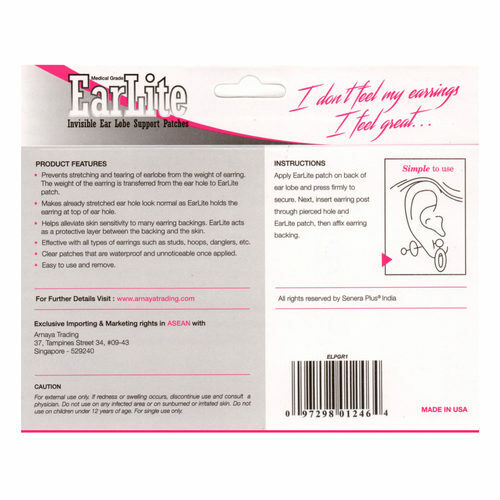 ▪Prevents stretching and tearing of earlobe from the weight of earring. 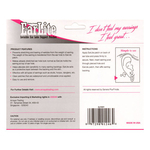 The weight of the earring is transferred from the ear hole to EarLite patch. ▪Makes already stretched ear hole look normal as EarLite holds the earring at top of ear hole. ▪Helps alleviate skin sensitivity to many earring backings. 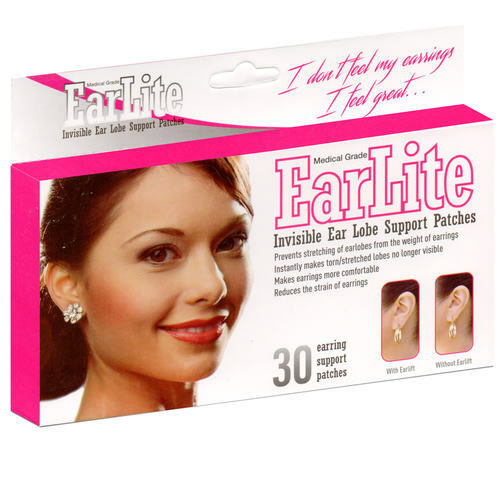 EarLite acts as a protective layer between the backing and the skin. ▪Effective with all types of earrings such as studs, hoops, danglers, etc. ▪Clear patches that are waterproof and unnoticeable once applied. ▪Easy to use and remove. 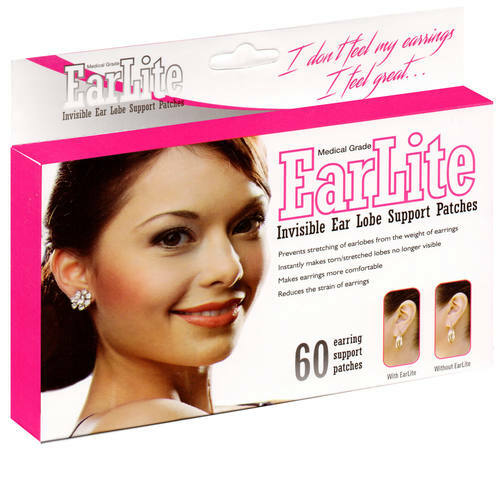 ▪EarLite is a safe and effective alternative to expensive and painful plastic surgery ▪Product is Made In USA How to wear: EarLite patches have self sticking medical grade adhesive on one side. Just stick one patch behind your ear lobe. Wear the earring from the front. The earring will pierce the patch and the patch will hold up to 70% weight of the earrings enabling you to comfortably wear heavy earrings for a very long time. 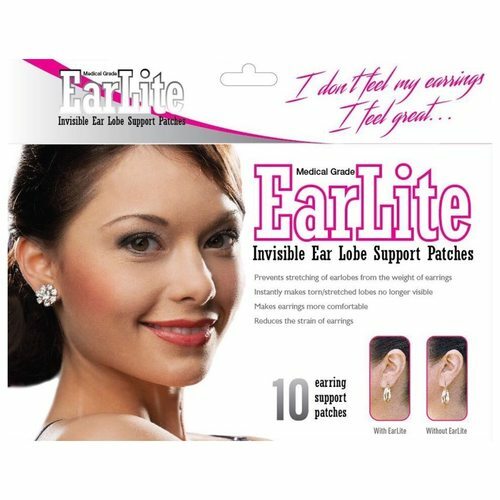 Even if your earlobes are already stretched or torn, EarLite patch will keep the earring from falling down and would keep them at the top of the earhole. Delivered within 3-4 working days. Free delivery for total order above $19. For orders less than $19/-, a $2.50 delivery charge applies. For secure payment we are using PayPal. However, you DO NOT need to be a PayPal member to make payment. For non PayPal members, once you click the PayPal logo at checkout, choose the option to proceed as a guest and then you can make payment using all major credit cards (without the need to sign in or create a PayPal member ID). Cash on delivery option is available in limited locations in Central and East Singapore. Where we are unable to provide cash on delivery service, we will contact you for payment via bank transfer.